In this chapter we’ll look at all the ways we can make code that gives results that depend on values. First up, let’s look at a program that takes a name, then prints a message, depending on what the name is. message name = if name == "Dave"
then "I can't do that." We see message is a function that takes a String and returns a String. The String it takes as an argument is named name in the body of the function. It’s pattern-matched into the name variable, is another way to say this. The if...then...else expression is one way we can control what will happen in Haskell programs. It’s very good for what’s called a two-way branch; that is, when there are two “paths” to take: the path for True or the path for False. (It’s either True that name is "Dave", or it’s False). The result of the if expression is dependent on the variable named name. Here we have a new typeclass constraint, this time called Eq. This operator works out if its two arguments evaluate to the same value. If so, it returns the Bool value True, otherwise False. Bool is the type which comprises just the values True and False. These are used to express whether things are true or not in Haskell. Eq provides the (==) and (/=) operators. They mean “is equal to”, and “is not equal to” respectively. Eq is short for equal or equality. An if expression has three sections, and it must always have three sections. The first section is an expression that must evaluate to a Bool value. You can begin to see why (==) is quite an important operator now, can’t you? When it evaluates to True, the expression that follows “then” is returned, otherwise the expression after the “else” is returned. The entire if expression always results in a single value, both of its return expressions must have the same type. So, what if we want to actually test for more than just two alternatives? (maybe “Dave”, “Sam” or other). else if name == "Sam"
So now, it’ll check if the name is Dave: if so, it’ll respond with “I can’t do that” as before, otherwise if the name is Sam, it’ll respond with “Play it again”, and if it’s neither, it’ll be “Hello”. Phew! Look at that if expression! What a mouthful. And this will only get more annoying as we add more options. then if name == "Sam"
else "I can't do that." No surprises here, we just have to flip the branches around as we’ve done. Having this many branches in our if expressions is not very easy to read. Let’s look at a better way to do the same thing. Before we do this, though, it should be mentioned if you're writing these programs in, then realise that the spacing matters in Haskell! So, we must indent our lines properly. There is actually another way we can write haskell which uses lots of punctuation instead of spacing, but spacing looks nicer, so we will use that. Here we’re using a case expression. You can see how it works pretty easily when comparing it to the nested if expressions from our previous example. "Dave" -> "I can't do that." "Sam"  -> "Play it again." To evaluate a case expression, the expression between “case” and “of” is first evaluated, then Haskell will run through all the patterns we have given it on the left of the -> symbols, and try to pattern-match the value with them. If it finds a match, it returns the corresponding expression to the right of the -> symbol. Case expressions are incredibly powerful because of the pattern matching we can do. Here we’ve just shown you an extremely basic example where the single name expression name is matched to simple value String patterns. The order matters! In this case, even if name is "Dave", the code will never get that far, because the underscore matches on everything, and it’s first in the list! In this case, our program will compile just fine, but it’s not what we want. This is called a logical error, because while it’s syntactically correct, it doesn’t have the correct logic. If we compile this with a Haskell compiler such as GHC, it will issue us a pattern-match overlap warning, letting us know that we’ve got multiple paths of logic flow for the same inputs. Do note, also, that all of the types of the result expressions have to be the same. The same rule applies from the if expressions, above. You can’t have a different result type in any of the expressions on the right. The whole case expression is a single expression, so it must result in a value of a single type. | name == "Dave" = "I can't do that." | name == "Sam"  = "Play it again." So we immediately notice that the function definition’s = symbol is gone from the right hand side. It no longer says message name = ... but rather there are multiple “definitions” each with a pipe (|) symbol in front of them. The way this works is that the expressions on the left are tested for equality to True, in order. When a True value is found, it returns the expression to the right of the = sign that corresponds to that expression. This is not pattern matching like in the case expression, but rather test for truth, so it’s subtlely different. This is quite good for when you to test for several things. Also notice that where a case or if expression can actually be inserted anywhere you like, this one is only usable in named function definitions. You can't use this form within a lambda, for example. Which of course, because it’s testing for True, will always match. The only difference is, otherwise actually means something to human programmers, so that’s why we use it. Wherever possible, we should endeavour to make our programs as clear as possible for our future selves, and others who may want to read our code. Sometimes it’s quite literally the difference between our code being used or not. message "Dave" = "I can't do that." message "Sam"  = "Play it again." Here we’re using pattern matching again, but directly on the argument list. Notice that the name variable is gone entirely, and our old friend the underscore is back. That’s because we’re directly pattern matching on what the name value would be. In the simple examples we’ve shown, none of the techniques stand out as obviously better or worse, except the if expression when we want to match on more than one thing. The case expression is probably the best fit, because there’s less repetition. Each have benefits and drawbacks, and we’ll see more of each of them as we proceed. This section is mostly to get you familiar with them. As what we need changes, the different conditionals will make more or less sense. What if we needed to detect if the name started with a “D”? In that case, the if expression or guard pattern would make more sense to use than the others. The case expression, or other direct pattern matching style examples wouldn’t make sense there. "Dave"  -> "I can't do that." "Sam"   -> "Play it again." Two parts to your homework. First is to try all the examples yourself. 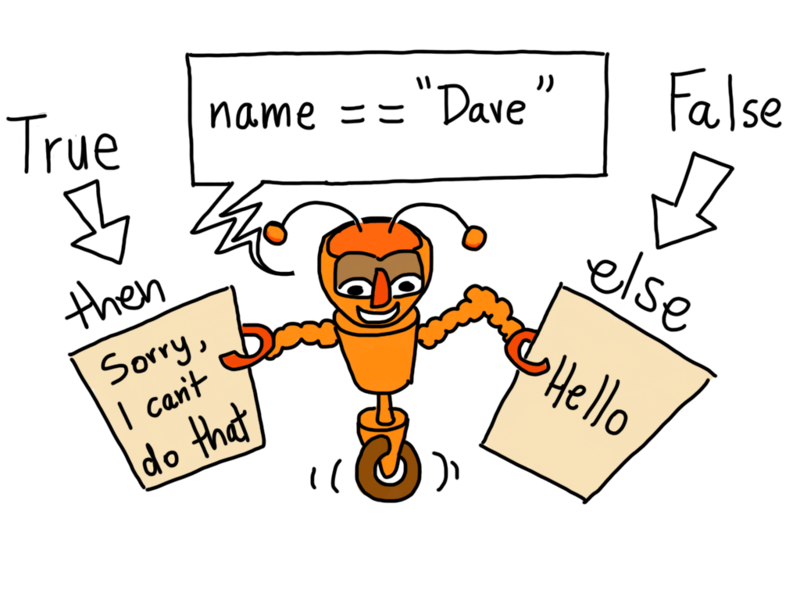 Experiment with changing "Dave" to other names, then do an internet search for examples of each type of conditional technique and recognise the pieces. Don’t get too worried that they won’t look as simple as our examples here. Just use our examples as a kind of guide, and try to pick out the pieces you do recognise, and don’t get confused if the examples you find look crazy. Ignore the crazy for now and look for the parts you do recognise. The second part of your homework is to help reinforce your understanding of currying. Maybe you forgot what that was. It’s when we use two or more functions wrapped around themselves to make a way for a function to take multiple arguments. And, because the way function application works in Haskell, we can apply values to it in this way addThem 1 2 3 4, then it will return 10. So, we can see from this that addThem is defined as a function that takes a variable called a and returns a function. That function uses a deep inside its bowels; that second function is a function that takes a variable called b, and so on, until you get to the inner function body of the function that takes d as its argument. You can see how these variables match up to the type signature above it, which we’ve put parentheses around to group them, showing the way Haskell builds the functions up more clearly. We can see from that quite clearly that 1 has been substituted in for a within the function. We don’t need the outer part of the function syntax \a -> any more because we’ve applied that function to the value 1, which makes it disappear. We hope this is clear, if it’s not at all, we’d really appreciate your feedback. You can give it by following the feedback link on the main page.